Despite many speculations, the anticipated US-led airstrike inflicted severe blows to Syria’s Bashar Assad regime. While many chemical facilities became targets to provide some cover for civilians from horrendous attacks in the future, the main message was sent to Iran. A rain of missiles and warplanes attacking Assad’s military and chemical sites made the Syrian dictator understand the golden years of Obama’s presidency has ended completely for him, Iranian Supreme Leader Ali Khamenei & Russian President Vladimir Putin. Iran, considering Syria its own backyard, is now facing major decisions about its future in the Middle East and back home. After the West has raised demands for Tehran to significantly curb its ballistic missile program & regional meddling, this attack, only a month prior to US President Donald Trump’s May 12th deadline, will certainly demand a heavy price from Tehran. US warships and B1 stealth bombers, French Navy vessels, Rafael and Mirage warplanes, and British Tornado fighter jets were the western alliances’ arsenal against Assad’s military. Tomahawk cruise missiles levelled the Mezze military airbase southwest of Damascus. Iran-made Zolfaqar & Qiam missiles, along with their launchers, were reportedly destroyed. 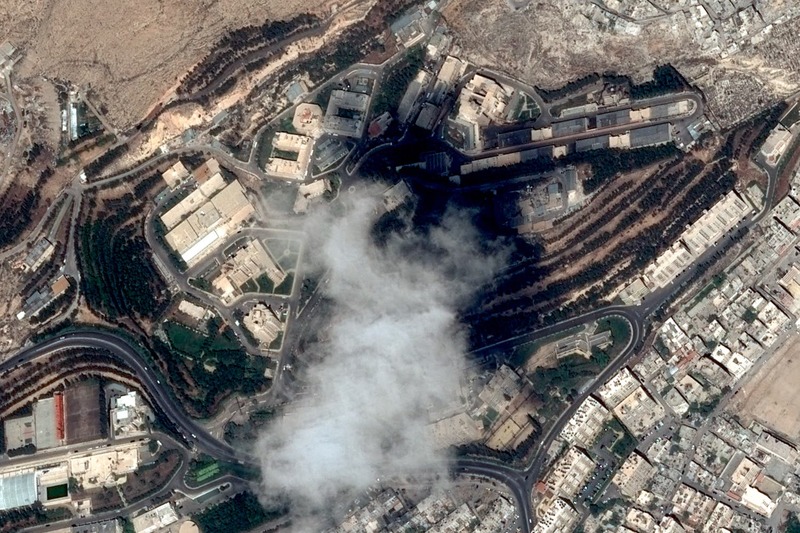 The Jibil Qasioun base, north of Damascus, is destroyed, reports add. This was the Syrian army’s intercepting facility, modernized by Iran, and used as a base by the Lebanese Hezbollah. The Chemical Research Center near Damascus & the Barzeh military-research base were both targeted by US missiles, leaving at least 5 Revolutionary Guards (IRGC) Quds Force members killed, reports indicate. Even though 90 percent of Iran’s IRGC Quds Force units evacuated all bases prior to the attack, sources in Syria say at least 15 IRGC Quds Force advisors were killed in these attacks. Their bodies are reportedly missing. 40 Lebanese Hezbollah members & 35 Syrian military personnel were also killed. 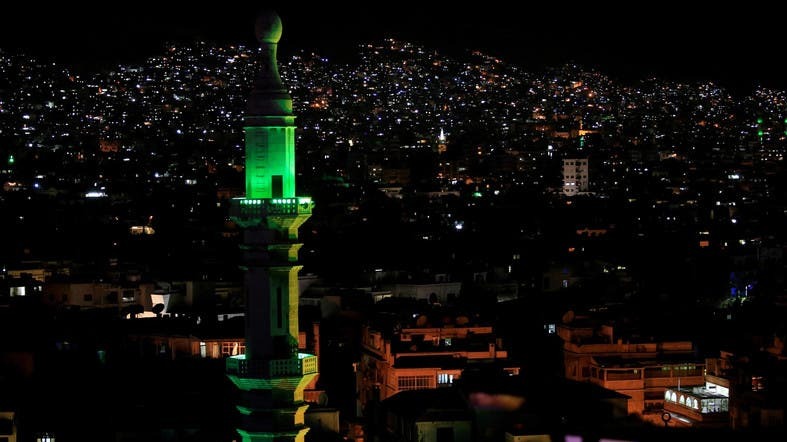 Sources indicate these attacks have inflicted billions of dollars in damages to missile & arms depots in Homs, and military facilities in Hama, Mezze & Jibil Qasioun. Despite claims made by Iran & Syria-associated media, all missiles inflicted severe damages on their targets, to say the least. In a desperate measure, Iran and Syrian state TV stations aired archived footage of Saudi air defense units intercepting Houthi missiles, claiming to be Assad’s forces taking action. The Pentagon literally ridiculed such claims, saying Syria’s air defense units fired around 40 SAM missiles that were mostly ineffective after mainly fired after the airstrike, most likely placing civilians in danger. With France and the United Kingdom directly taking part in these attacks, it is now clear that the U.S. and Europe will join forces against Iran’s interests at times of sensitive geopolitical matters. Russia chose to remain completely inactive and Iran, despite its previous threats of wiping Israel off the map in response to an attack on Syria, literally sees its forces on the run. Claims of Assad’s units downing missiles are highly questionable, especially since the French and British warplanes would have been far easier targets. To add insult to injury for Tehran, further reports indicate further attacks targeting Iran-backed units on Saturday night and early Sunday morning local time. Trump has warned that the US is ready to strike again if the Syrian regime resorts to further chemical attacks. America is ready to maintain pressure on Bashar Assad until he ends the process of killing his own people, he added. US Ambassador to the UN Nikki Haley used very blunt language in saying her country is ‘locked and loaded’ to strike again in response to any new chemical attack, sending a very significant message to Damascus, Moscow and most importantly, Tehran. Trump came under criticism over his remarks of seeking to pull out of Syria and leaving for others to finalize the remaining necessities. Criticism continued after he tweeted saying the missiles “will be coming,” apparently going against his principle and giving away the element of surprise. However, the element of surprise is useful in mostly single-stage attacks, such as the April 2017 US missile strike on the Al Shayeerat air base following Assad’s chemical attack against Khan Sheikhoun. Although that sent a political message to Assad and his sponsors, it did not prevent the regime from resorting to further chemical attacks. The early morning April 14th airstrike enjoyed the support of France and the UK, and a conglomerate of weaponry. Parallel to the political message, Assad’s chemical arsenal is now crippled at least for years to come, according to the Pentagon. There are signs that the military presence of Iran’s IRGC and other militias in the region will become the next of focus of US policy in the region. It is clear Iran will continue its blueprint of using militias in Iraq, Syria and even Persian Gulf states, such as Bahrain, to advance its objectives across the region. If Washington is serious about establishing meaningful peace and security across the region, placing Iran’s Middle East meddling in its crosshairs is a must. Crippling sanctions against Iran’s IRGC and the regime’s Central Bank will deliver the necessary punch. Such a policy can go alongside pressures on the Iran nuclear deal prior to Trump’s deadline and the US Treasury Department vowing to add “very strong,” new “primary and secondary sanctions” against the regime. Washington is taking steps to corner Tehran. A comprehensive strategy is necessary to resolve the nuclear deal mess, completely end Iran’s destructive influence throughout the Middle East, impose meaningful sanctions targeting Tehran’s financial network and most importantly, supporting the ongoing Iranian protests as this nation vividly abhors their unjust rulers and demands regime change.